Spider mites affect many crops worldwide. 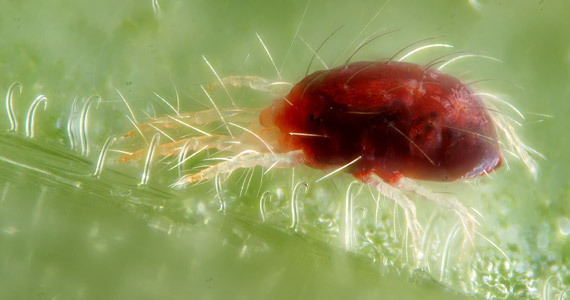 There are well over 1200 species of spider mite, of which more than a hundred can be considered as a pest, and about ten of those as a major pest. The most wellknown and problematic spider mite is Tetranychus urticae (common names include red spider mite and two-spotted spider mite). Their ability to reproduce extremely rapidly enables them to cause enormous damage in a short period of time. Spider mites have needle-like sucking mouthparts. They feed by penetrating the plant tissue with their mouthparts. Large populations can even cover entire plants with their web. These webs are used to move around. Because spider mites are so small they can easily move through ventilators. Spider mites are not insects and are in fact more closely related to spiders. They belong to a class called Arachnida. Spider mites usually spin a silk webbing. When spider mites infest plant leaves, they damage the plant tissue leaving yellowing and dead spots that coalesce until eventually the entire leaf is affected. The leaf will turn yellow, wilt and finally be shed. 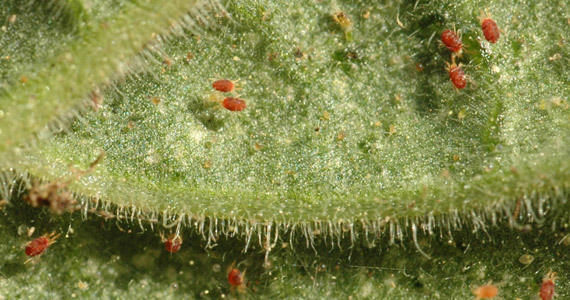 There are some varieties of mites that do not spin webs and live in the plants bud terminals, where the damage cannot be seen until the tip expands. Each female two-spotted spider mite lays 10-20 eggs per day, and 80-120 altogether during its life cycle of up to four weeks. These are mostly attached to the silk webbing. The six-legged larvae hatch after 3-15 days. Newly hatched larvae are almost colorless and have bright red eyes. They moult three times within 4-5 days, becoming a protonymph, then a deutonymph and finally the adult form. Both adults and nymphs have eight legs. The first visible symptoms will be small yellowish or whitish specks, mainly around the midrib and larger veins of the leaves. If these spots grow bigger and merge, the empty cells give some areas of the leaf a whitish or silvery-transparent appearance. To minimize the risk and rapid spread of spider mite infestations, try to keep the temperature lower (<77 °F) and humidity higher (>60 %), since this will slow the rate of reproduction. Higher humidity is also needed for the predators of the spider mite. Keep your growing areas clean and remove all leaf litter. Adequate irrigation is important, because water-stressed plants are more likely to suffer damage. When you see spider mites (recognizable from silk webbing on top of the leaves), remove the affected leaves. Spray the plant thoroughly with a mixture of alcohol and soap. Repeat this treatment several times a week.